If you’re not getting ready to look towards the night sky tonight, you’ll be missing out. At 7.13pm South African time, the moon will start moving into the penumbral (partial) shadow of the earth. Less direct sunlight will reach the eastern (lower) side of the moon, and you may notice the moon dimming slightly from that side. At 8.24pm, the moon will start moving into the umbral shadow of the earth. From this time, the moon will appear to change shape. From 9.30pm to 11.13pm, the moon will be totally eclipsed. At 12.19am, the moon will be out of the earth’s umbral shadow and the observable eclipse will be over. The next total lunar eclipse visible from start to finish from anywhere in Africa will be in 2025. Below is an interview with Daniel Cunnama, of the South African Astronomical Observatory about tonight’s astronomical event. On July 27th, 2018 most of the world will be treated to an extraordinary evening of activity in the sky. 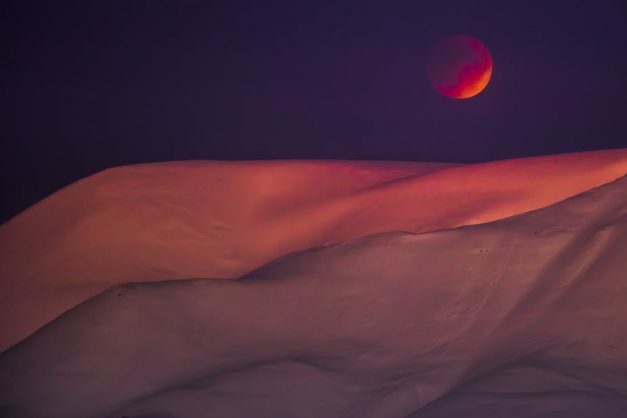 First, there will be a total lunar eclipse and although uncommon, this one is special because it’s going to last a lot longer than usual – in fact the longest this century. But that’s not all. Mars will shine brighter than it has in 15 years. Caroline Southey asked Dr Daniel Cunnama to explain the significance. Near to the reddish lunar eclipse, Mars will also be looking fairly spectacular. It will be at opposition, which means that it’s at the opposite side of the Sun to the Earth. This means it will be very bright – even brighter than Jupiter. It will also be nearly three times brighter than Sirius – the brightest star in the night sky. The Sun, the moon and Venus will be the only (natural) objects in the sky brighter than Mars. The moon will begin to move into the penumbra – the fuzzy outer edge of the Earth’s shadow – at 17:14 GMT. A dark wedge will begin to appear on the surface of the moon. The moon will begin to appear reddish around 18:24 GMT as it moves into the main part of the Earth’s shadow. Totality will begin at 19:30 GMT and last until 21:13 GMT. This is when the moon is completely inside the Earth’s shadow and is the most spectacular part of the lunar eclipse. It will appear as a dark, reddish disk in the sky.